Cataract surgery is performed routinely every day throughout the world. It is one of the most technically advanced areas of medicine. Yet, many patients still may have fears and misunderstandings about this medical procedure. Cataract surgery is not a new medical treatment. Surgery to remove the clouded lens of the eye dates back to the ancient Babylonians. Many advances in surgical techniques have, of course, been made over the years. The cataract surgery that your grandparents may have had, was often a very trying ordeal with a long hospital stay, considerable discomfort and even longer recovery period. They then had the sole option of using cumbersome cataract glasses to compensate for the removed lens. Today, however, everything has changed. The development of advanced surgical techniques and intraocular lenses have made cataract surgery one of the most successful forms of treatment in the medical profession. The operation is usually performed on an outpatient basis, is virtually painless and has a recovery period of a few days. The vision provided by an intraocular lens is as clear as that provided by the eyes’ natural lens. The human eye works much like a camera. Light enters through the front of the eye called the cornea. 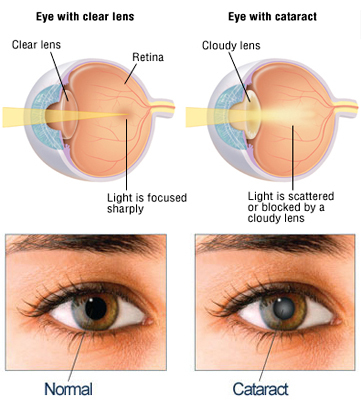 Light rays are bent by the cornea and the lens of the eye so that they focus on the retina. How clear and sharp an image is formed on the retina determines how well you will see. A cataract is a clouding of the normally clear lens of the eye and this interferes with the normal passage of light rays to the retina. The result is a general dimming of vision. A cataract may be slow to develop but once it appears, it almost always continues to become more cloudy. Historically, cataracts have been the most common cause of loss of vision. The only treatment is to remove the clouded lens or cataract. Early forms of cataract surgery were often a difficult ordeal for the patient. Today modern medical advances have made cataract surgery one of the most successful forms of surgery. New surgical techniques can restore vision in 97% of all cases. There is no known treatment such as diet, exercise, eye drops or laser technology that will clear up a cataract or prevent its formation. When a cataract has developed on the lens of the eye, the only way to restore clear vision is surgical removal of the lens and replacement with a permanent lens implant. Once a cataract has been removed, it will not come back. There are many new developments in the field of intraocular lenses. Myopia, hyperopia, astigmatism and accommodation can now all be corrected or at least be improved significantly with the newer lenses. The new implantable lenses are foldable and therefore can be inserted through a very tiny incision. Toric lenses can improve astigmatism. The newest developments are accommodative and multifocal lenses that can actually focus, which means that glasses post operatively will seldom be needed. The most common technique nowadays, is intracapsular cataract emulsification (phaco emulsification). A very small incision is made in the eye (+/- 3mm) and the cataract removed out of the capsular bag that surrounds it, by means of a thin ultrasonic probe that emulsifies the cataract (clouded lens) and aspirates the material. The capsule membrane is left in place. The smaller incision helps the eye to heal and vision to return much quicker. This membrane also serves as a platform and bag for placement of the intraocular lens into it. In some cases the capsule may become hazy months or years after surgery. If this occurs, a YAG Laser can be used to put a small opening in the middle of the capsular bag to clear the vision. Because of the small size of the incision, the wound can be made in a special way so that it is self sealing and does not require any stitches. This shortens the recovery period. Patients can see and read more naturally after the operation. Patients should be careful not to rub or press on the eye for a few days post operatively. Other than that they can continue with their lives as normal and do not anymore need to be bedridden. They may now bend down and wash their hair etc. as long as they don’t exert or strain themselves excessively. Laser technology can be used for cataract removal, but, it’s use is still limited at this stage. However it does play an effective role in follow-up care. After surgery, a small percentage of patients will experience a temporary clouding or blurring of vision when tissue in the lens capsule becomes clouded. This is quickly and painlessly resolved with the use of a neodymium YAG laser. Tissue clouding, once treated, will not recur. You can drive there and back yourself and do not need a driver for this procedure.